Centrum Wiskunde & Informatica: Exploring the limits of modelling thrombus formation: Comment on “Modeling thrombosis in silico: Frontiers, challenges, unresolved problems and milestones” by A.V. Belyaev et al. 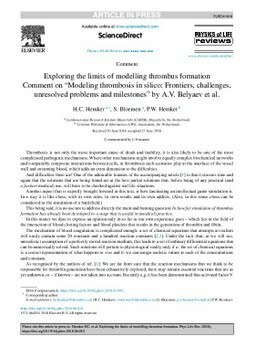 Exploring the limits of modelling thrombus formation: Comment on “Modeling thrombosis in silico: Frontiers, challenges, unresolved problems and milestones” by A.V. Belyaev et al.